The Humane Party has published the second full draft of the Abolition Amendment, a proposed amendment to the United States Constitution. 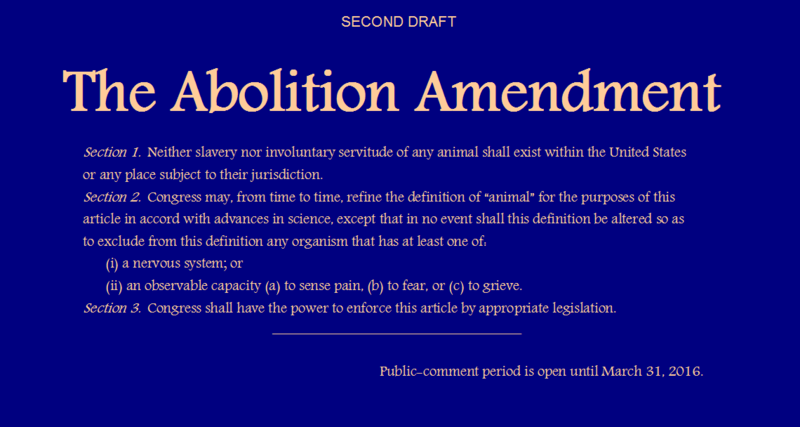 Upon ratification, the Abolition Amendment will immediately abolish the property status of all animals, thereby ending the meat, dairy, egg, vivisection, and other exploitation-based and killing-based industries. The current draft of the Abolition Amendment will now be available for comments, criticisms, and editorial suggestions from the public through March 31, 2016. The text of the Abolition Amendment will then be revised again, if necessary, in light of comments received. The revised draft will then be subjected to another thirty-day public-comment period, and this process will be repeated as necessary until a final draft has been completed. Publication of the final draft of the Abolition Amendment is scheduled for American Abolition Day (December 6) 2016. Comments on the Abolition Amendment may be submitted by way of the Humane Party’s main website at www.humaneparty.org or its social media page at www.facebook.com/humaneparty. The Humane Party’s announcement comes approximately five weeks after closing of the public-comment period for the first draft of the Abolition Amendment. The present draft avoids certain terms used in the first draft that were criticized by some reviewers as unnecessarily esoteric (such as “sentient” and “animalia”) in favor of plainer language. The present draft also provides two separate, independently sufficient modes for ensuring that protection under the category of “animal” cannot be withdrawn in the future. The first mode relies upon anatomy, namely, the presence of a nervous system. The second mode relies strictly upon capacity without reference to any particular physical feature that enables such capacity. (ii) an observable capacity (a) to sense pain, (b) to fear, or (c) to grieve. Section 3. Congress shall have the power to enforce this article by appropriate legislation.